Welcome to our Store. We look forward to serving you. Batson’s Drug Store and Family Market is a unique shopping experience. In addition to having a full service pharmacy, we also have a full-line grocery store with a full-time meat cutter and fresh fruit and vegetables. We also have an old-time soda fountain with 16 flavors of hard-dipped ice cream and all those old fashioned treats you haven’t enjoyed in a while. 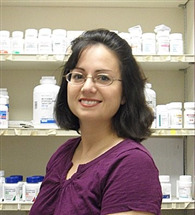 Julie Perkins is the Pharmacist and Owner of Batson’s Drug and Family Market. She graduated from the KU College of Pharmacy in 1992 and has owned the store since moving back in 1995. Julie and her husband Patrick both graduated from West Elk High School in Howard in 1987 and have 3 daughters. They are both extremely committed to Elk County and enjoy living in this small community. Julie is involved in many local organizations because she believes it is important to give back to her community.